Ebi Ten Japanese Fast Food (map, 388 Robson Street, Vancouver, BC, Canada, phone: 604-689-9938) is a bright, bustling take-out restaurant across from the Vancouver Main Library downtown that serves inexpensive sushi, teriyaki, tempura, and other tasty Japanese food selections. The restaurant is run by mostly Japanese students who are very efficient at serving big lineups quickly. Fast food is the name of the game here – Ebi Ten seems to have taken a cue from McDonalds and if there is a big line, someone might take your order while you are still in line, so that when you get to the cashier your food will soon be ready. Pictured below is some of the ready-made sushi that is available in the refrigerated display case at the entrance to the restaurant. A roll such as the ones pictured costs in the range of $1.75 to $3.00 depending on the type. 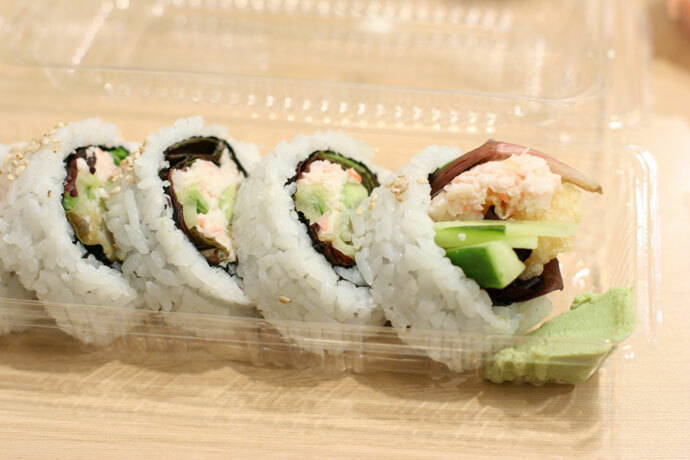 I really like the Ebi Ten Roll (pictured below) and the Tuna Avocado Roll (also pictured below). Other fun treats to try are the Takoyaki, the battered and deep fried octopus balls which are served with a topping of mayonnaise (not pictured), and the green Seaweed Salad (pictured below) which has a delicate, slightly salty flavor and is a little bit chewy. Ebi Ten Japanese Restaurant is within walking distance of the major theatres such as the Queen Elizabeth Theatre, the Playhouse, as well as the sports stadiums (GM Place Stadium and BC Place Stadium), making it a good place to go to grab a quick bite before a concert, theatre play, or game. 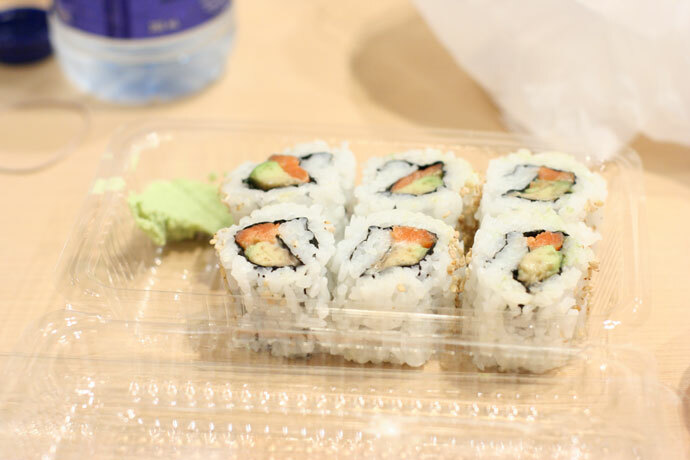 Don’t expect haute cuisine here – the food is simply cheap, fast, filling, and can satisfy a sushi or teriyaki craving. For more photos and info please view: Part 1, Part 2. Tuna and Avocado Roll Sushi from Ebi Ten Japanese Restaurant in Vancouver BC Canada. Ebi Ten Roll (around $3) from Ebi Ten Japanese restaurant in Vancouver, BC, Canada. 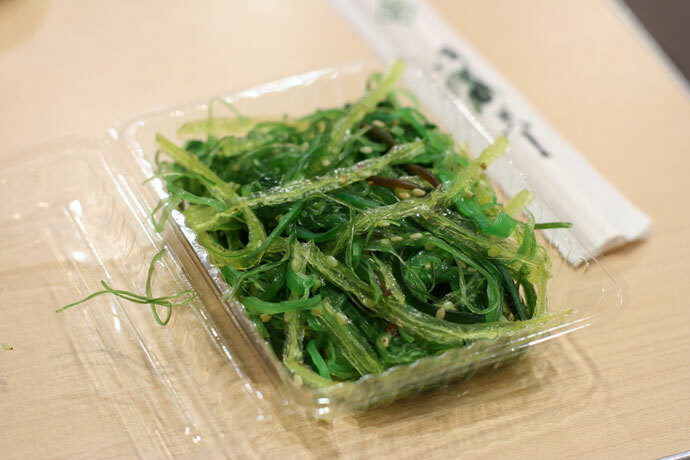 Seaweed Salad from Ebi Ten Japanese Restaurant in Vancouver, BC, Canada. I made another lunch time visit to Zachary’s on Robson (map, web site, 121 Robson Street, Vancouver, BC, phone 604-605-1472) and was very pleased with the food this time. Apparently the restaurant is under new management, and I think the chefs are really on the ball now. I had ordered several different cream-based pastas from Zachary’s on my previous visits, but for some reason the flavors of the sauce seemed a bit off, maybe a strange aftertaste -it’s hard to describe, but I can tell when a restaurant does its pasta sauce right. 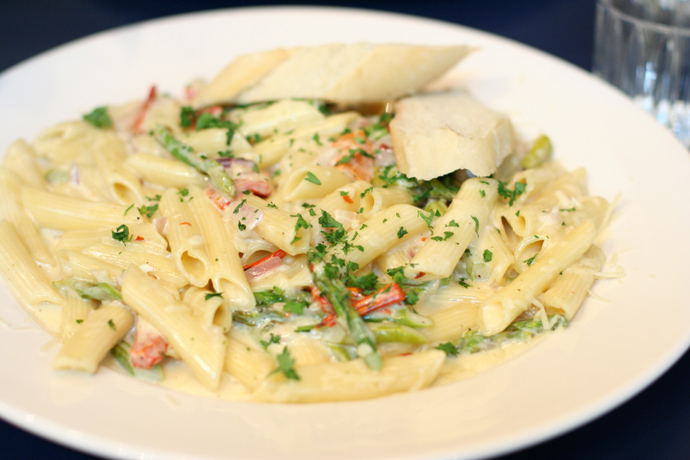 This time I was extremely happy to take the first few bites of my gorgonzola penne ($12.95, pictured below) and finally encounter a pasta sauce that frankly delighted my tastebuds with honestly good and sophisticated creamy sensations. The aftertaste was clean and faded away quickly, preparing my palate for the next bite. I made it through the entire, generous dish without getting tired of the ingredients, which is a problem I run into when eating huge amounts of pasta at places like Antons in Burnaby. (Well, thinking again, it was good except to maybe the third or second to last bite, but this was pretty much the best as I could expect for a pasta costing $12.95). Free Coupon! I was given two coupons by the restaurant in my bill, and I would like to give them away to some readers of this site who are interested in trying the food. The first coupon has $3 Off Lunch (“Join us for lunch and receive $3 off per couple or $1.50 for a single lunch, Valid until June 30th, 2009”), and the second coupon has $5 off dinner for a couple on one side, and on the other side, a pre-game event prime rib dinner special for $13.95. Please note that in order to get these discounts you’ll need to get the actual coupon from me, since they won’t accept printouts. If you’d like a coupon, please email me (geoff@gpeters.com) and first person who emails me will get one coupon. Second person will get the other coupon. You can pick the coupon up from me in Yaletown. I’ll post a message here when the coupons are gone. View More Restaurants in the GM Place Stadium category. 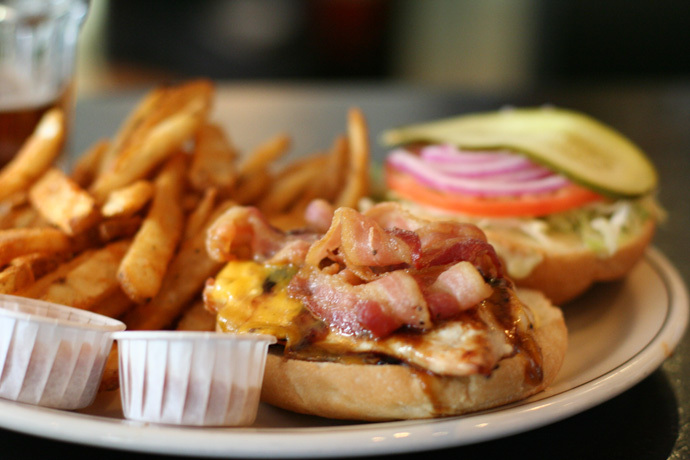 We hope you enjoy the great GM Place Stadium restaurants on Dine Out Here Vancouver.